Photo: L-R Airman Damon Douglass and his father Senior Master Sergeant Terrance Murphy. Courtesy of Joseph Murphy. Damon Douglass the son of Terrance Murphy and Ariana Murphy from Lackwood WA, completed United States Air Force basic military training at Lackland Air Force Base, San Antonio, Texas on 5 Apr 2018. 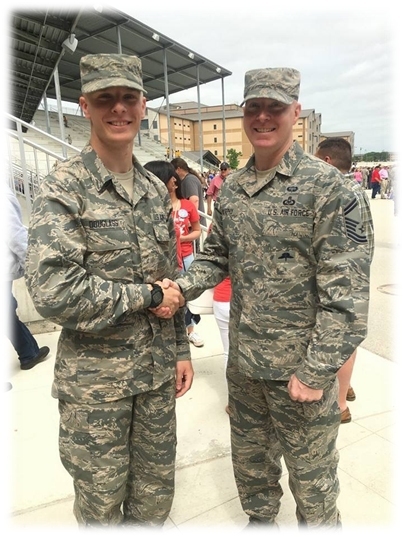 Damon follows in the footsteps of his Dad who has served in the Air Force for more than 22 years and currently holds the rank of Senior Master Sergeant. Damon will serve as Intel/1N0 and his next assignment will be Goodfellow AFB, TX. Damon is the great-great-great grandson of Mary Tinneny of Goladuff, Newtownbutler, county Fermanagh, Northern, Ireland and the great grandson of her granddaughter Maryann Murray and her husband Joseph Murphy of Gloucester City, New Jersey.